Mac OS X, PC Windows, iPhone, iPad, Linux compatible. For any astrologer out there, reports and interpretations will give a precious astrological help, for example as a memo for transits dates. In 1993, Astroquick softwares were the first to provide editable interpretations in any size. Always ahead of their time, AstroQuick 7 softwares are the only ones to provide editable interpretations as far as word processing on Mac Linux or PC, especially interactive interpretations reports with sky chart and links that you can customize with your name, addresses and website. With the HTML format, you are just a few clicks away from emailing full and universally compatible interpretations. All the versions are provided with the editorial interpretation of the AstroBasic chart. The PERSO and latest versions provide basic astrological material, like the lists of positions (birth chart, charts comparisons, returns, directions and transits) and the lists of AstroCloud symbols (key words cloud, editing material). Interpretations modules of the PLUS CLASSIC DELUXE and PRO versions are very neat, after a hard work of several years made by the astrologer Patrick Giani, author of numerous successful astrological books (cf list below). 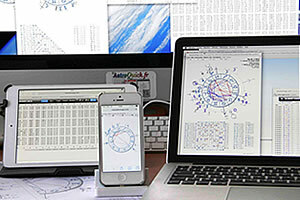 Thanks to its modern and innovative conception, the AstroQuick 7 search engine will automatically select the corresponding paragraphs to planetary elements displayed on the sky chart. In a few clicks you can get partial interpretations, for example, without the ascendants nor the houses, or even without the trans-saturnine. To look at an example of interpretation, click on the name of the module in the charts below. Interpretations modules available in each version of the software. With AstroQuick 7 you are provided full reports in only one file with all the graphic information, sky charts, interpretations, shaping and interactivity. Thanks to the HTML universal format, you can email documents very easily; they will stay 100% compatible with all the internet softwares of your correspondents. AstroCloud Technical interpretation of the planetary positions with key words (key words clouds). versions PERSO and latest versions. Perfect for a commercial use with no royalties! Avec la User license of the version PRO you can market the astrological studies that you printed or emailed (other user licenses will allow you to use it at home too). To check on the user license of the software AstroQuick 7, with its personal or profesional utilisations, click here. To order a personalized astrological study with your birth date, click here.